CATS are being stolen and pitted against fighting dogs in illegal blood sports, according to the owner of a local rescue centre. More than 15 cats are believed to have been taken in Blackburn in recent weeks. The incidents sparked fears the pets are being killed by dogs as part of a shocking new craze sweeping parts of the country. One charity said it was a ‘very worrying time for cat owners living in Blackburn’. ‘Cat coursing’ is on the increase in several northern towns where dogs are deliberately set on cats as part of their ‘training’ for fights with other dogs. There are even reports of them being put into wheelie bins, which act as make-shift cages. Eunice Faulkner, who owns Blackburn Cat Rescue in Pleckgate Road, said she believes the pets are being stolen to be used in cruel sports such as cat coursing and also dog baiting, where two dogs are set on the cat. Dog-baiting has been banned since 1835 under the Cruelty to Animals Act. Eunice said: “There hasn’t been a spate like this for years. “It happened a few years ago when they were being stolen to be used in dog-baiting. “The friendliest ones are easiest to catch as they will let people approach them. She said it is very suspicious for the cats to vanish in these circumstances and for none to be seen again. People have reported some disappearances to her and, in one incident last month, five cats disappeared from the Wensley Road area. On Wednesday night, two went missing from Quebec Road. “I have been told about 15 incidents. There could be even more. 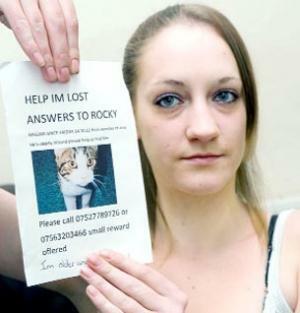 Sarah Bailey, who lives in Wensley Road, had her cat Rocky stolen on October 23. He hasn’t been seen since. She said: “He’s part of the family. He’s such a lovely cat, but he’s completely disappeared. “My next-door neighbours had their cat stolen as well, and somebody else up the road. “We are really upset. We’ve tried everything to find him. A spokesman for the League Against Cruel Sports said: “It is absolutely horrifying that these animals are being used in this way. Leanne Plumtree, from the RSPCA, said: “It does seem very strange for so many cats to have gone missing from the same streets in such a short space of time. A Cats Protection spokesman said: “It is very concerning that so many cats have gone missing, and this is understandably a very worrying time for cat owners living in Blackburn. “If anyone has any information about these disappearances, then we’d urge them to contact the RSPCA or Police immediately. “Owners can also help to keep their cats safe by keeping them in at night and ensuring they are microchipped and neutered. * Cat coursing is a new barbaric craze where dog owners watch their pets main and harm cats. * Darlington has become a hotspot for cat coursing in recent weeks. An eight-year-old cat called Mitzi was attacked by a lurcher. An owner had to put his cat down after finding it savaged. Another woman reported a dog owner throwing his dog over a fence to get at her cat. * Problems have also been reported in Doncaster and parts of north east Scotland. * Police and the RSPCA are beginning to receive reports from horrified owners. Scottish police have promised ‘zero-tolerance’ and custodial sentences. * East Lancashire has had a number of prosecutions for dog-fighting, where men meet in secluded areas and gamble.